We visit our friends in Haiti when circumstances permit us to do so safely. Between earthquakes, elections and a cholera epidemic, was not possible in 2010, but we resumed visits in 2011 and 2013. Maintaining a personal relationship with the pastor (Fr. Bicahara Delisca) is extremely important. We are in touch by e-mail, phone and in person so that we can know and relate to you what is happening in Lilavois. Please browse these pages, and as you do, remember our Haitian friends and everyone who works and contributes to serve them. 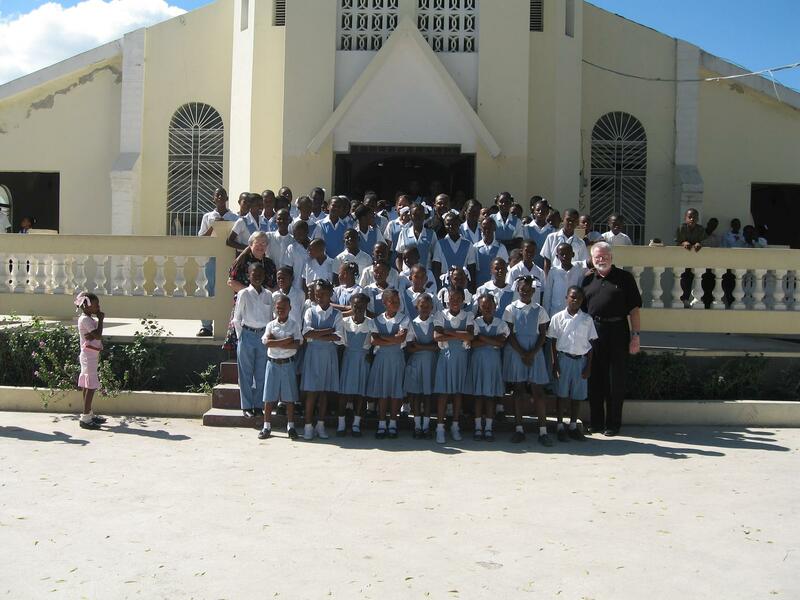 Deacon Tim and schoolchildren after Sunday mass, February, 2009. The school year is the same as it is in the US, but the curriculum is modeled after the French system. The church you see in this picture was destroyed in the January 2010 earthquake. Funds to rebuild it will be supplied by the diocese of Port-au-Prince. We have helped rebuild the walls surrounding the complex, the rectory, parish center and several classrooms. Take a look at the pictures on the bulletin board on the right-hand wall at the main entrance to the church to see what other damage the earthquake did.